MSE Creative Consulting Blog: "No Respect"
Is it me, or is Al looking a bit like Rodney Dangerfield? It is probably due to the week he has had. 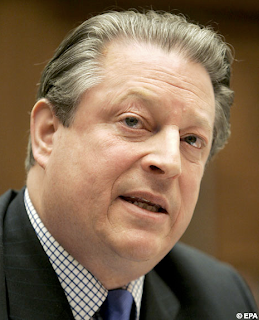 You may have heard that Mr. Gore has cancelled his presentation in Copenhagen. The Climategate email has been pouring in (note the meteorological metaphor) today, so I am going to post a few more comments later tonight or tomorrow. Stay tuned. "Breaking issues around the treaty talks" sounds like Gore didn't want to be around pesky reporters and citizens asking 'inconvenient' questions.